"Facing tough times, 7 million Americans will start gardens," claims today's Oregonian  front page article. Today’s enthusiasm for growing food mirrors the victory garden movement during WWI and WWII. We hear mostly about the incredible success of the gardens during WWII. However, war gardens started in WWI and were quite a failure, mostly due to pests and disease and novice gardeners' ignorance. One curmudgeon warned zealous victory gardeners not to pull up all of their shrubs and flowers to plant food, but to test their soil, see about the viability of growing food before they waste limited amounts of fertilizer and seeds. Even Eleanor Roosevelt, in a New York Times article I can't seem to find again, was quoted saying in exasperation that the White House soil proved impossible for growing vegetables! Today, seeds, soil, and even fresh starts of edible plants seem in abundance, and perhaps beginner’s luck will be in abundance, too. I’m all for everyone growing food, but I don’t want the beginning gardener (of which I still am one) to get discouraged and give up. It’s hard to grow food, and no matter what all the lawn chair ads portray, it’s not exactly relaxing! Don’t get me wrong, I’m hooked, and planting two blueberry bushes last October proved to be the highlight of 2008 for me; however, since starting to grow food, I have more to worry about. 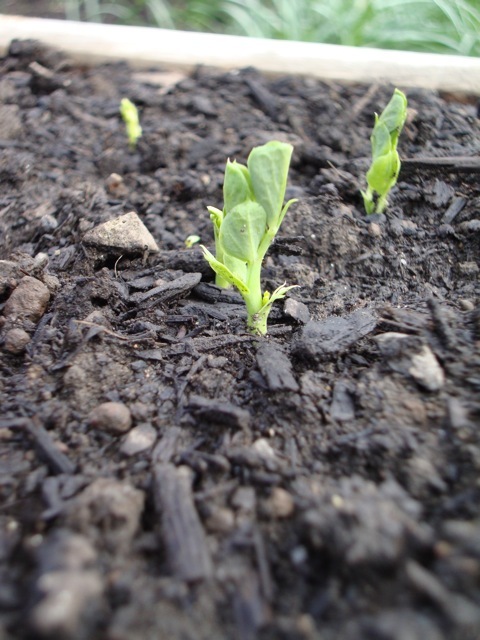 Was it too cold last night for my pea starts? Do slugs eat bell peppers? What’s that white mildew stuff on the chard? Why does my rosemary seem to be drooping? Is it too late to start eggplants from seed? Ignorance is not bliss for the beginning gardener, but knowledge is not bliss either! What I do not know turns every garden quandary into a potential threat to me and my edibles. However, seeking answers often makes it worse. Gardening books terrify me. A few pages into climate-zone-this, and ph-soil-test-that, and plant-after-threat-of-frost-unless-this-or -that… and I’m overwhelmed, wondering why I can’t just stick a seed into the ground and watch it come up. Which is what I do—stick seeds in the ground and watch them come up, and they usually do. Well, maybe there’s nothing to worry about after all. Have at it 7 million Americans!